The the Hollywood Reporter's coverage actually felt the need to "clarify that Moore had not mentioned American Sniper in his tweets." Well, fine, but it's not as if it wasn't obvious. 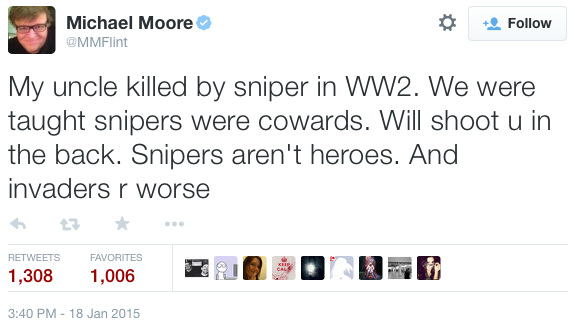 Moore's record for accuracy isn't exactly stellar. His documentary, "Fahrenheit 9/11," had 56 deceits both within the movie itself and in representations made about it and its promotion. Expect the negative leftist reaction to ramp up. 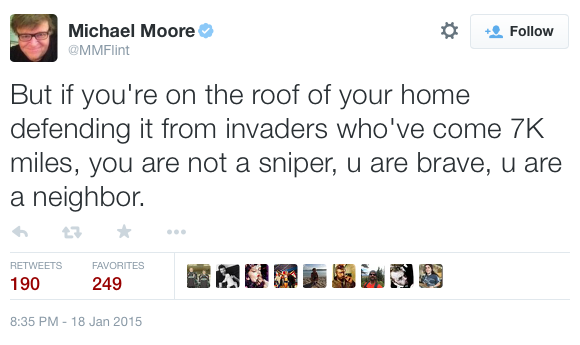 The popularity of "American Sniper" is sure to send more of them over the edge in the coming days. Also expect passive-aggressive versions of such sentiments to make their way into establishment media reports.